Your PC is under attack on all fronts. These eight free downloads and services will help you beat back the bad guys with antivirus and antispyware programs, personal firewalls, and even a program that can detect whether your Web site is under attack. The excellent Avast Home Edition antivirus software download does what more expensive programs of its type do, but for free. BEST BET Avast Home Edition: The big names in security software charge you big bucks for big suites full of big, bloated software. It scans your system for malware and kills what it finds, and gives you seven different types of "shields" to keep you safe from harm, such as one for protecting you from dangers that might be lurking on Web sites (such as drive-by downloads), one for guarding against peer-to-peer attacks, another that stops instant messaging threats, and so on. And it does all that, amazingly enough, without taking up much RAM or system resources. a-Squared HiJackFree: Spyware is notorious for evading even the most rigorous cleaners, which is why you need more than one antispyware utility on your PC. HiJackFree is a great download to use in concert with your main antispyware program for extra protection. Rather than offering a live shield, it checks your system for spyware and then eradicates it. For the geeky, it offers a lot more as well, such as tools for viewing what programs are using your TCP ports, and for examining programs that run on startup. Attack Trace: Worried that the bad guys are targeting your Web site? This free service checks to see if your site is under attack. Comodo EasyVPN Home: This download allows you to create secure peer-to-peer networks over the Internet for sharing information, chatting, and so on. Everything is encrypted, so no one else will be able to snoop on what you're doing. EULAlyzer: Hidden in some end-user license agreements (EULAs) are indicators that the software may be spyware, or that it might invade your privacy in other ways. This downloadable analyzer examines EULAs and warns you about dangers. Online Armor Personal Firewall: This is the best personal firewall you've never heard of. It provides solid protection, but unobtrusively. Lots of firewalls bug you constantly when you first install them, asking about any program that wants to access the Internet. This software starts out by allowing known safe applications to access the Web and bothers you only about the programs it's unsure about. It also has a clever "Safer mode" that will allow certain apps to run with stripped-down privileges. 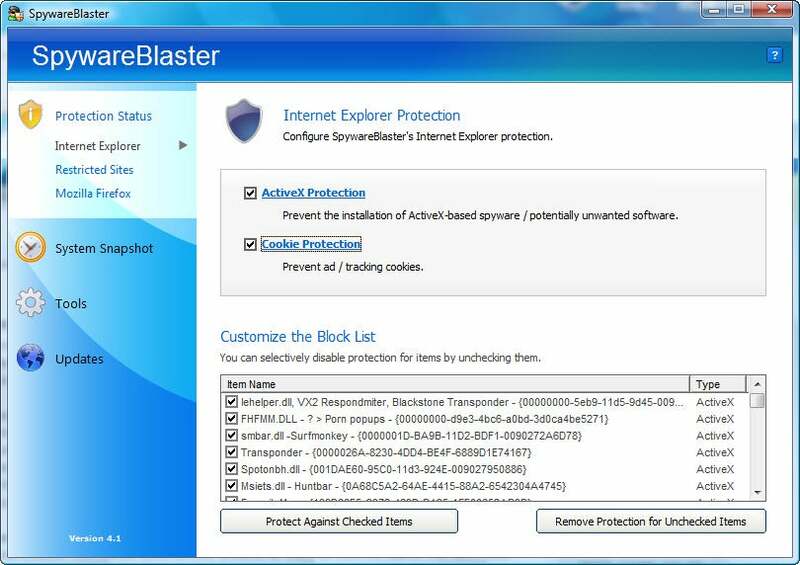 SpywareBlaster protects against ActiveX controls, tracking cookies, and more. SpywareBlaster: With this downloadable antispyware utility, you can make sure you don't get infected in the first place rather than scanning for and killing spyware after it hits your machine. It works differently from most competitors by restricting the actions that potentially dangerous Web sites can perform when you visit them. It also protects against dangerous ActiveX controls, and keeps tracking cookies off your PC. SuperAntiSpyware: Here's an excellent antispyware tool that does a thorough job of scanning your system for dangers, and then whacks any it finds. This download scans not just your files and memory, but also your Registry. It doesn't offer real-time protection, though. Your guide to the "101 Undiscovered Freebies"